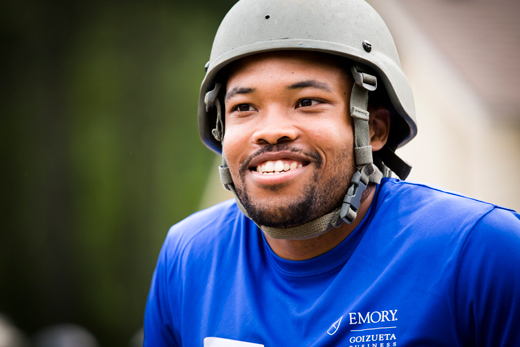 To start the day at Ft. Benning, Goizueta MBA students are all smiles. The Leader's Reaction Course at Ft. Benning requires sound planning and a little strength for the execution. 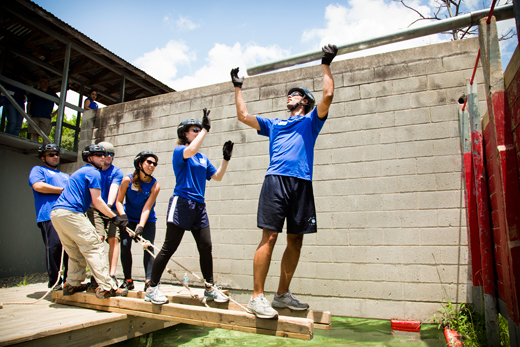 Using just a few supplies, students on the Leader's Reaction Course have to come up with a plan to complete a task, like scale a wall across the water. 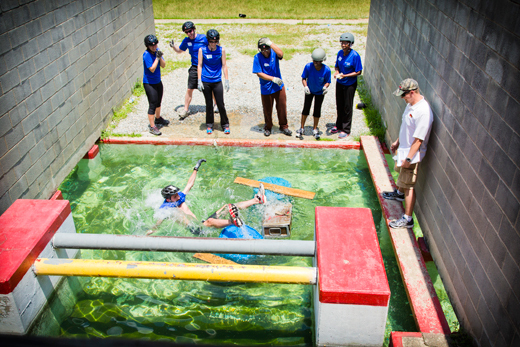 A student falls in the water while attempting to complete one of the missions on the Leader's Reaction Course at Ft. Benning. Students find various skills helpful in completing tasks at Ft. Benning. Army facilitators provide initial instruction and take note of the team's performance. 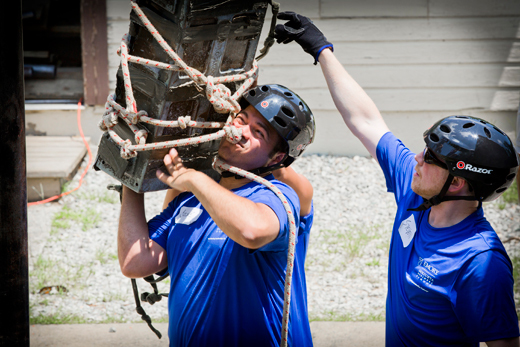 Students on the Leader's Reaction Course are tasked with moving equipment over obstacles using any means necessary. Students from Goizueta Business School's One-Year MBA class traveled to Ft. Benning, Georgia, on July 12 to complete a rigorous Army leadership course. Emory Photo / Video. 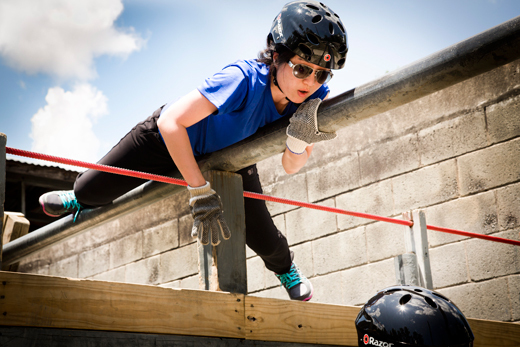 Sitting atop a climbing wall at Ft. Benning, four Goizueta Business School graduate students stared at the obstacle below. The pool of water surely looked refreshing in the Georgia heat, but jumping in would not accomplish the "mission." On July 12, Goizueta's One-Year MBA class traveled to this Army base near Columbus, Georgia, to complete training usually reserved for military officers. 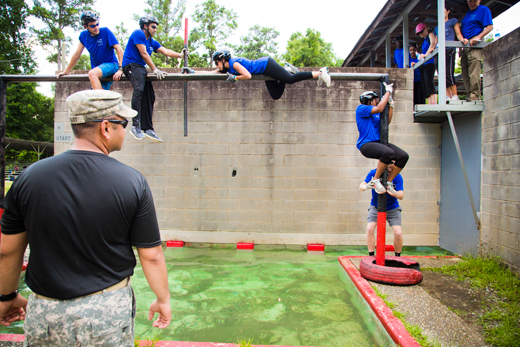 The Leader’s Reaction Course (LRC) contains more than a dozen obstacles designed to test physical strength, mental aptitude and — most importantly — quality, style and effectiveness of leadership. The "LRC" is more than walls, moats and ropes. It's a gauntlet of mental challenges designed to test even the most seasoned teams and leaders. 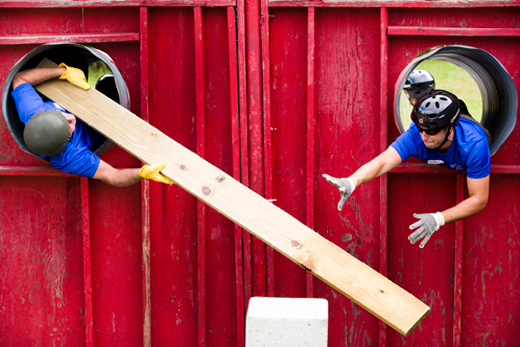 Each team is given a goal and rudimentary supplies like lumber, barrels and rope. They must overcome obstacles that include water, heights and the occasional optical illusion placed to confuse and misguide. "What we are seeking to do is bring leadership alive for these students," said Ken Keen, associate dean for leadership development at Goizueta. Keen, a retired Army lieutenant general, "lived" the course multiple times in his military career. Missions are timed: just 30 minutes to plan and execute. This immediately puts the team leaders' communication skills in focus. "It was really challenging but it was also a lot of fun," said Nicole Bullock, who is studying at Goizueta after working in human resources. "It brought out some good qualities and some not-so-great qualities that we can go home with and continue to work on." At the close of each mission volunteer facilitators from the Georgia Army National Guard provided feedback on the team's performance and leaders' effectiveness. Each student faced at least one obstacle in command, which resulted in varied approaches and unique team-building opportunities. "I learned a little about the style of leadership others have," said Tim Skeen, who returned to business school from a career in consulting. "I have the way I like to lead, but that's not the right way to lead necessarily." Back in the classroom, MBA students will evaluate their success and failures. Goizueta has a proven leadership curriculum. Now, reviews from Army officers and hands-on experience at the LRC can be added to in-class discussion. A full "de-brief" was scheduled for class time the week after the event. "It gives you a good sense of how well they work together as a team and, in some cases, it gives them a workout on how to deal with failure," Keen said. "We want to give them the opportunity to receive feedback." "I think there's a lot to be learned in a hands-on experience like this," Skeen said.